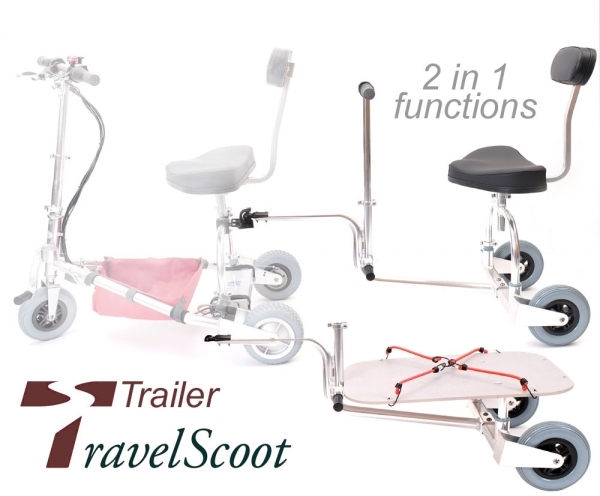 Product information "TRAVELSCOOT Trailer 2-in1 for persons and freight"
This is a is a multifunctional trailer with 2-in-1 principle. On the one hand you can take a person on board with the trailer (and the included seatsystem) and on the other hand you can transport a lot of different things on the included platform - boxes, backpacks, dog basket, and and and... - loads up to 110 Kg and the weight of the trailer is just 5 Kg without seat and 7 Kg incl. the seat. Size = 112 l x 53 b x 28 h and the trailer platform to load things comes with 62 x 42 cm. Not for use on public roads! Related links to "TRAVELSCOOT Trailer 2-in1 for persons and freight"